The Kestrel 'Scout' features a resilient frame, and pocket clip in aerospace grade titanium. The razor-sharp blade is in ZDP-189 steel. The one-hand button lock and the thumb stud are set with blue topaz. 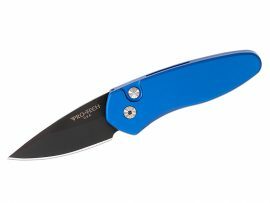 The Kestrel is a compact but versatile folder that works and presents beautifully in any situation; the design, which offers a deep finger groove at the intersection between the handle and blade, makes this knife remarkably comfortable in the hand while being very small and easy to carry. 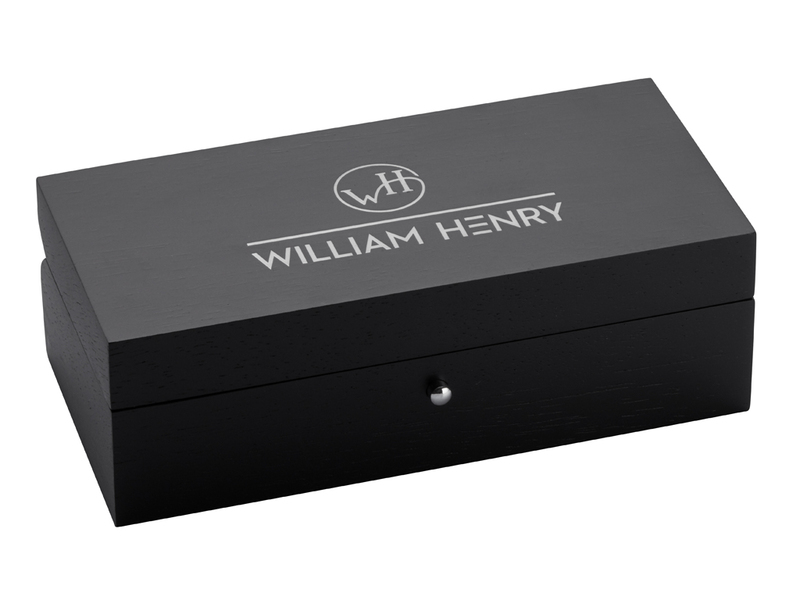 The 'Scout' features the exotic materials and hand-forged metals that are the hallmark of William Henry's collections; a distinctive personality statement to be worn and used for a lifetime. The design, which offers a deep finger groove at the intersection between the handle and blade, makes this knife remarkably comfortable in the hand while being very small and easy to carry as a daily tool. We employ three basic architectures for handles on our pocket knives, and all are featured in the Kestrel Collection. Every knife (with the exception of the all-titanium handle) includes our leather ClipCase and a braided lanyard with sterling or gold fittings to match. 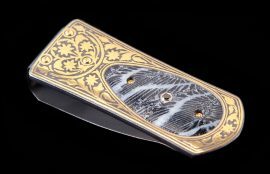 Each piece is engraved with two distinct numbers – a serial number on the blade and limited edition number on the leading edge of the handle. The numbers, along with the details about the knife's construction, are listed in the included Certificate of Authenticity.